In this groundbreaking book, prize-winning pianist and noted educator William Westney explores some important paradoxes about making music. 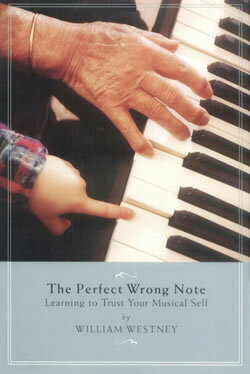 Playing a wrong note can be a perfect event: constructive, useful, even enlightening. Misplaced perfectionism, in contrast, can hamper learning and rob us of the fulfillment and transcendent enjoyment that music can bring. Drawing on insight, experience, and wisdom ancient and modern, Westney lays out healthy alternatives for lifelong learning and suggests significant change in the way music is taught. Teachers, professionals, and advanced students of any instrument, as well as parents and music lovers of all ages, will find hope and inspiration in this wise teacher’s practical, clear guidance. Westney’s approach makes eminent sense. Imagine a child’s natural, joyful immersion in the musical moment. Then consider the loss of that spontaneity that too often results from formal music lessons. But this needn’t be the case if we rethink what happens, and what can happen, in the practice room, in performance, and in music lessons. The energetic creator of the acclaimed Un-Master Class® also looks beyond the individual lesson to the special potential of group work. He outlines the basics of the revelatory workshop that has transformed the music experience for participants the world over. The goal: to bring artistic vitality, self-trust, and confidence within everyone’s reach. William Westney holds two endowed faculty positions at Texas Tech University as distinguished artist/professor, and has been honored with many professional awards, including the Yale School of Music Alumni Association’s prestigious Certificate of Merit, for his distinctive and innovative contributions to the teaching of musical performance. His acclaimed Un-Master Class® performance workshop, which has been featured in The New York Times, is increasingly in demand in the United States and Europe. Westney was the top piano medalist at the Geneva International Competition and holds master’s and doctorate degrees in performance from Yale University.